Closely resembling a diamond the Isle of Wight has around 60 miles of the best coastline in the UK with a pleasant climate and beautiful beaches it has become a favourite destination for the British holiday maker. The coastline of the island is full of contrast and provides sweeping sandy bays, muddy estuaries, rocky coves, shingle beaches and spectacular chalk cliffs. The south west of the island is classified as Heritage coast and an area of outstanding natural beauty surrounded by high crumbling cliffs popular with fossil hunters and excellent conditions for surfers, kite borders, wind surfers and paragliding. The top of the island in contrast is mostly shallow muddy beaches and estuaries. Whilst much of the islands coastline is rural and rugged some areas mostly around the south eastern shore have been heavily developed and provide excellent facilities to beach goers. The Isle of Wight now boasts 14 award winning beaches recognised by EC water regulation and testing. Of the 14 award winning beaches 3 are blue flag winners, a voluntary eco-label awarded by the Foundation for Environmental Education. Interestingly if you were to divide up all the beaches in England and Wales each man, woman and child would have a round 4 inches if you shared the beaches on the isle of wight amongst the population everybody would have around 30 inches each. If you plan to take your dog with you to the beach please note that between May and September dogs are restricted to certain areas of some beaches and are banned on all major resort beaches. Click here for information on dog restrictions. As with all beaches there are hazards both on the beach and in the water. Please read our Isle of Wight beach safety guide for more information. Access to Ventnor beach is via Shore Hill, which leads down to Ventnor Harbour and car park, there is another car park at the other end of the esplanade above the Spyglass Inn and if your lucky you may also be able to park along side the esplanade. Ventnor is a sand and shingle beach protected by rocky outcrops. At mid to high tide Ventnor beach provides safe swimming and at low tide rock pool for the children. The esplanade has a multiitude of refreshment vendors with cafes, pubs and restaurants, for the children there are amusement arcades and a paddling pool shaped like the isle of wight. Fresh Ventnor crab, lobster and fish may be purchased from Blake's fisherman hut aswell as traditional fish and chips. Ventnor on occasion suffers from seaweed collecting in the Harbour and rotting which causes an unpleasant smell. 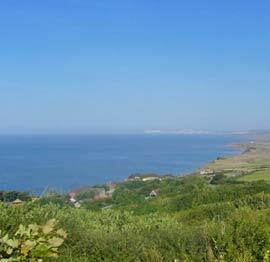 Huge sandy bay with Shanklin and Yaverland at either end. Sandown provides a shallow shelving beach which is clean, safe and popular with sun bathers and swimmers. In the center of Sandown Bay stands Sandown Pier which provides refreshments, rides and amusements. Life guards patrol swimming areas and first aid is available. Sandown is popular beach for watersports so pay special attention to the water safety zones which are designed to prevent watersport practitioners from injuring bathers. Sandown beach front is littered with amusements and activities to keep your children entertained including Dinosaur Isle, Browns golf course and lots of amusement arcades. Shanklin beach can be found at the end of Sandown Bay and is popular with families due to its golden sands and great facilities. 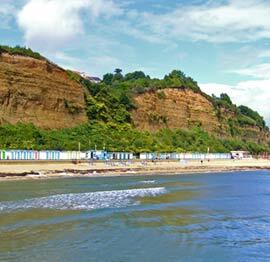 Shanklin provides a shallow sloping beach which is safe for bathing. Although a smaller beach than Sandown, Shanklin still provides as many great facilities catering for all tastes from pitch and putt to peddle boats. There are 3 car parks and public toilets next to the pitch and putt. One of the largest beaches on the island, Ryde is a very shallow sandy beach with extreme tides and on low tides you can walk out some way into the solent. With multiple car parks as well as parking along the esplanade access to this beach is easy. Close to Ryde town and its shops the beach boast an unbelievable array of facilities including a funfair, amusements, boating lake, cafe's, pubs, nightclub, beach shops, children's playgrounds, indoor swimming pool, paddling pool, nightclub, bowling and ice skating rink. Compton Bay (also known as Hanover Point) is a popular beach located at the southwest of the island towards the Freshwater end of the A3055 Military Road. A gently shelving sandy beach it is popular with surfers and kite boarders. Access to the beach is via a small set of steps leading down from the car park however some locals like to park on the roadside grass verges and climb down the shallower sections of cliff. The car park is a reasonable size and has public toilets and an ice cream van. Compton is surrounded by large sand stone cliffs so beware of falling debris and watch out for fossils. At low tide fossilised dinosaur footprints are visible in the rock however over the years many have been taken. Please note that on very high tides the sea can cover most of the beach.